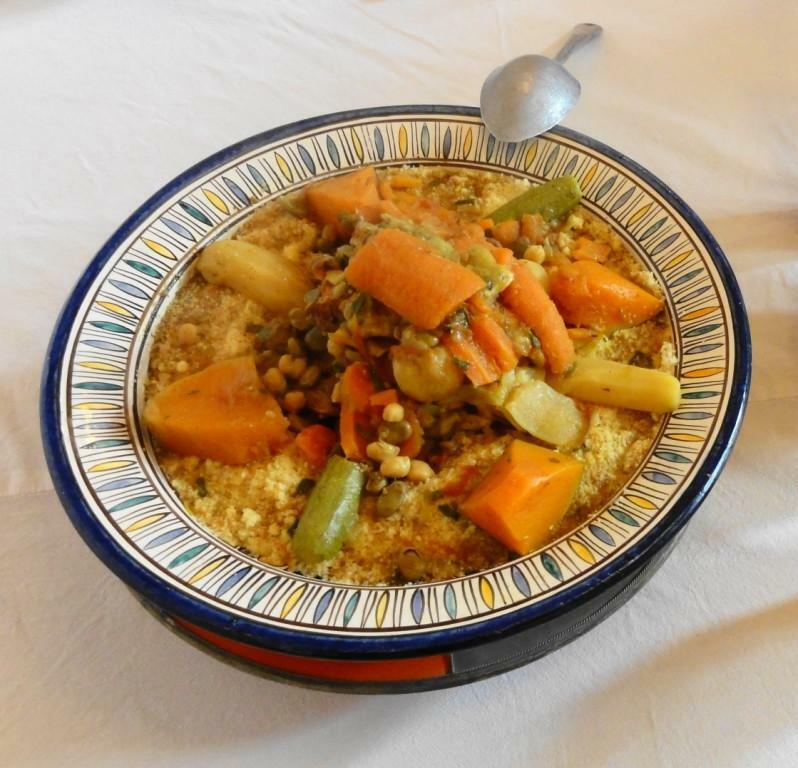 Discover the Moroccan cuisine through one of its best ambassadors, Bouchera. Moroccan cuisine offers a fascinating variety of flavors. It has been influenced by Arab, Berber, Moorish, Jewish and also some countries in Southeast Asia such as India. It draws on emblematic dishes known to all such as couscous, tajine, the barbecue as well as other less consumed outside of Morocco such as the pastilla or Harira (soup of breaking the fast of Ramadan). Morocco offers one of the most extensive range of dishes and will please all palates: from lovers of meat (lamb, beef, chicken) to fish lovers (especially in Essaouira) through vegetarians who will enjoy tagines, couscous and pastilla. Moroccan cuisine has a much more systematic use of certain spices than European cuisines and Bouchera is truly an artist when it comes to dealing with them. Riad du Figuier offers you a broad range of menus that should please everybody. All of our menus includes salad, main and a desert and come with a regular bottle of water per bedroom. You want to introduce you to the preparation of Moroccan cuisine. Bouchera will be happy to pass on her knowledge and guide you in making wonderful dishes. Learn how to make couscous semolina which is so smooth that the broth is superflux. During those classes, you will be given the opportunity to prepare a full meal with Bouchera and eat it then. Take the most of your stay in Morocco and learn how to make local pastries. Moroccan pastries dough needs to rest approximately half a day before being cooked. Therefore we recommend that you follow this class early in the morning to enjoy your pastries late in the afternoon or during the afternoon to have them the next day.